I don’t know about your household, but sometimes the end pieces of a loaf and be abandoned, never to be eaten. What’s a mom to do who doesn’t like to waste a single slice of her delicious Three Bakers gluten free bread? Look for new ways to use them up, of course! 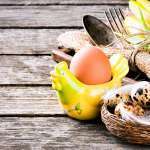 When looking for new ways to use up odds and ends, it is always wise to look up OLD ways of how others have done the same thing in the past. Using up extra bits of bread is a problem moms have dealt with all over the world… Which brings us to today’s amazing recipe. 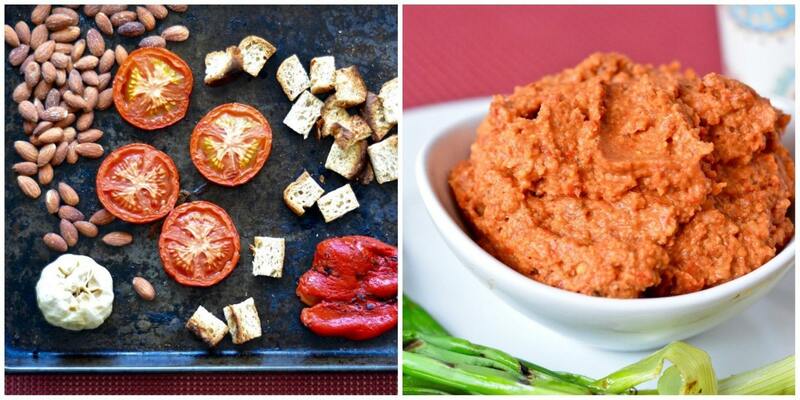 Migas Romesco is a rich creamy spread from Spain that contains roasted red pepper and tomatoes, almonds, and is thickened with toasted bread cubes. It originated in the Catalonia area of Spain, often served at late winter celebrations where huge quantities of local spring onions are grilled before being dipped into this luscious sauce. I may not have the more traditional calcotes onions) that are commonly served with Migas Romesco, but after grilling up some Spring Vidalia onions from my local market, I could see what the fuss was about. The sweet grilled onions really offset the creamy, smokey flavors of the sauce. So good! I discovered this sauce is also a great accompaniment to fish, scallops and poultry and a wonderful spread on a gluten free bread, and even caught my kiddos using it as a dip for steamed veggies. Preheat oven to 375°F. Place bread, tomatoes, and garlic on baking sheet. Place baking sheet in oven. Roast until bread is just starting to toast, about 10 minutes. Remove bread from baking sheet and set aside. Return baking sheet to oven and continue roasting tomato and garlic until garlic is soft, about 20 minutes more. Remove from oven and let cool slightly. When cool enough to handle, remove skin from tomato and peel garlic. While other ingredients are roasting in the oven, roast peppers over an open flame on a gas stove or grill until the skins are blackened. Place in a bowl and cover with plastic wrap and let sit until cool enough to handle, about 20 minutes. Remove charred skin, seeds, and cores (discard) and set roasted peppers aside until needed. In a food processor, pulse almonds, bread, tomatoes, garlic, peppers, olive oil, vinegar, paprika, salt and cayenne. Pulse until mostly smooth, but with still a bit of texture to it. Taste and add more salt or pepper, if needed. Place in and airtight container and place in the refrigerator until ready to serve. 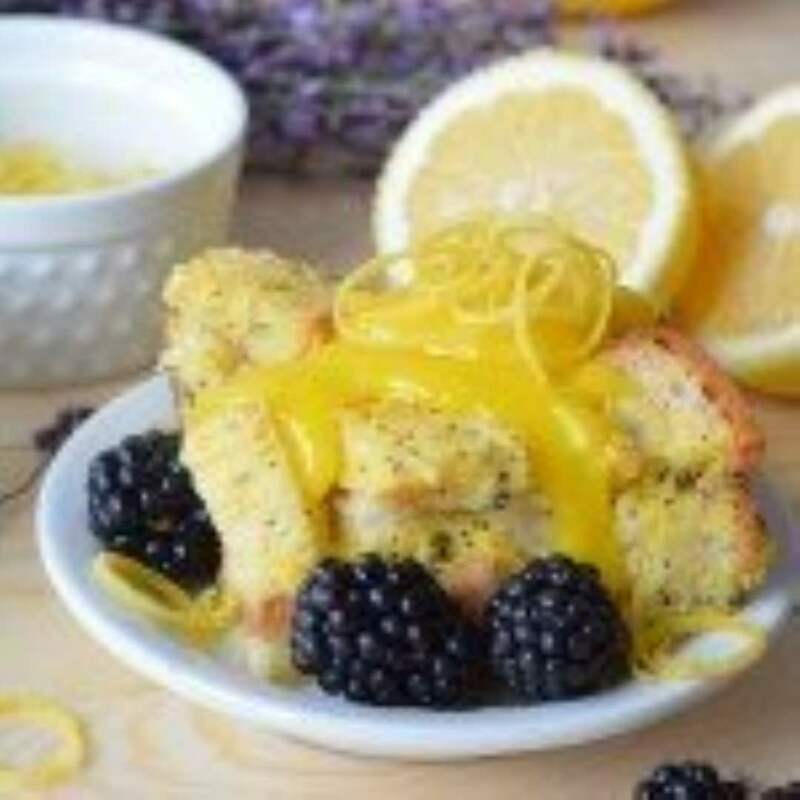 Follow more of Angela’s Recipes here.